Do you live in Wilton Manors? Wilton Manors is a city in Broward County, Florida, United States. As of the 2010 census, the city had a population of 11,632. Wilton Manors is part of the Miami–Fort Lauderdale–West Palm Beach Metropolitan Statistical Area, which was home to 5,564,635 people at the 2010 census. Although the city is very small geographically, portions of Wilton Manors are located in two separate U. S. congressional districts. Wilton Manors citizens are represented in Congress by Debbie Wasserman Schultz and Lois Frankel. In the early twentieth century the area now know as Wilton Manors was known as Colohatchee. A train stop along the Florida East Coast Railroad near the current NE 24th Street shared that name. The name Wilton Manors was coined in 1925 by Ned Willingham, a Georgia transplant and land developer. Wilton Manors was incorporated in 1947. The city is home to a sizable LGBT minority as well as winter vacationers, who frequent its many nightclubs and gay-owned businesses along the main street, Wilton Drive; the 2010 U.S. Census reported that it is second only to Provincetown, Massachusetts in the proportion (15%) of gay couples relative to the total population (couples as reported to the U.S. Census).It contains a large Pride Center, the World AIDS Museum and Educational Center, and a branch of the Stonewall National Museum & Archives, whose main facility is in neighboring Fort Lauderdale. The mayor, Gary Resnick, refers on his official biography to his male partner. While most of the gay guesthouses are to be found in neighboring Fort Lauderdale, a growing number are being established in Wilton Manors. A city web page highlights LGBT life in Wilton Manors, stating that "the City of Wilton Manors Police Department conducts police training that is geared towards working with the City’s LGBT population and has gay and lesbian officers amongst its ranks." Wilton Drive is the equivalent of "Main Street" in Wilton Manors. Over the past twenty years, the Wilton Drive corridor has undergone an economic transformation. Formerly a sleepy street lined with small retail shops, Wilton Drive is now the small City's Arts & Entertainment District, home to numerous restaurants, bars, shops, condos and rental developments that have blossomed over the last decade. Many of the businesses in the Arts & Entertainment District are LGBT-owned and/or operated, and "The Drive" has become a local, regional, and national destination for LGBT tourism. Another example of the economic revitalization in Wilton Manors is the Highland Estates neighborhood, which is bordered by NE 26th Street on the south, Dixie Highway on the east, the North Fork of the Middle River on the north, and NE 6th Avenue on the west, was significantly transformed in the decade from 1995 - 2005 from a blighted area to an upscale neighborhood with multiple new modern townhouse developments. Citywide real estate prices increased with, and even ahead of, the national trend in the years of the expansion of the housing bubble (2000-2007). In 2007, the city's taxable property values peaked at just over $1.26 billion, according to the Broward County Property Appraiser's office. Again following the national trend as the housing bubble burst, Wilton Manors real property taxable values fell 36% from 2007 through 2014 when an upward trend resumed. In 2014 the increase in Wilton Manors real estate values of 10.1% led Broward County. Wilton Manors is home to several recreational facilities, the largest of which are Hagen Park, Richardson Historic Park and Nature Preserve, and Island City Park Preserve. Other Wilton Manors parks include Donn Eisele Park, Snook Creek Park and Boat Ramp, and Colohatchee Park, a 9.3 acres (38,000 m2) recreational facility complete with a boardwalk for nature observation, a dog park, and a boat ramp for watercraft entry. In addition, there are several pocket parks throughout the city. Another major city park is Mickel Field, which was traditionally a busy hub for local baseball and softball leagues. At the request of the surrounding neighborhood residents, Mickel Field is currently undergoing a significant renovation and will re-open in the summer of 2015 with new walking trails, fitness station, picnic and performance pavilion, and other new facilities more in tune with the needs of current residents. Wilton Manors' first library opened on June 24, 1957, as a project of the Jayceettes and staffed by volunteers. "The city took over the library in August 1958... and moved the library to the original city hall. In 1960, the building was enlarged to double its space." In 2003, construction was completed on a 4,000 sq ft (370 m2) library expansion. This increased the facility's size to 6,500 square feet (600 m2). 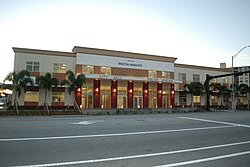 The library, now called the Richard C. Sullivan Public Library of Wilton Manors, is not a part of the Broward County Library system. It is one of only five municipal libraries in Broward Ccounty. The Richard C. Sullivan Public Library is a heavily used facility. The volunteer organization, Friends of the Wilton Manors Public Library, actively supports the library's collections and programming. Wilton Manors is located at 26°9′31″N 80°8′22″W (26.158712, -80.139516). It is bordered on the north by the North Fork of the Middle River and the city of Oakland Park; to the south, the boundaries include the South Fork of the Middle River and the city of Fort Lauderdale; the eastern terminus of the city limits extends to near Federal Highway (US 1); and the westernmost boundary reaches Interstate 95. Since it is surrounded by water, Wilton Manors has gained the nickname, "Island City." According to the United States Census Bureau, the city has a total area of 1.94 square miles (5 km2), all land. Wilton Manors is located at 26°9′31″N 80°8′22″W (26.158712, -80.139516). It is bordered on the north by the North Fork of the Middle River and the city ofOakland Park; to the south, the boundaries include the South Fork of the Middle River and the city of Fort Lauderdale; the eastern terminus of the city limits extends to near Federal Highway (US 1); and the westernmost boundary reaches Interstate 95. Since it is surrounded by water, Wilton Manors has gained the nickname, "Island City."